There is something about the Stone Tower Winery that makes you feel transported to another country. It feels like the Spanish wine country. 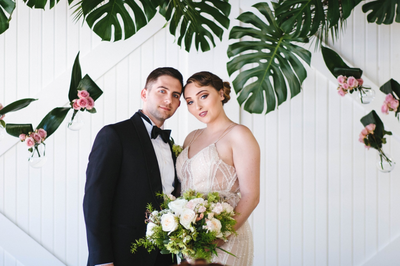 Collaborating with fellow Washington D.C. and Virginia wedding professionals is one of my favorite ways to bring a vision to life. 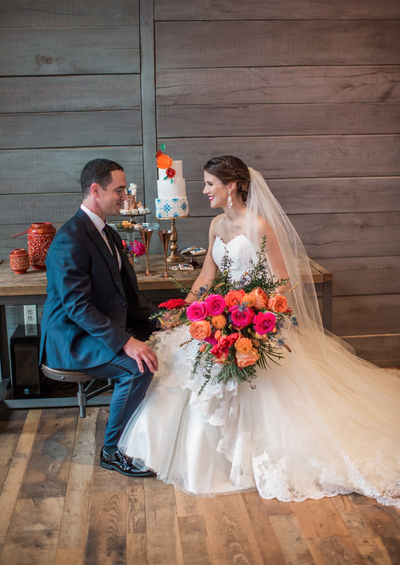 Together we created this gorgeous Spanish themed wedding inspiration. It was colorful, fun, and full of laid-back romance. 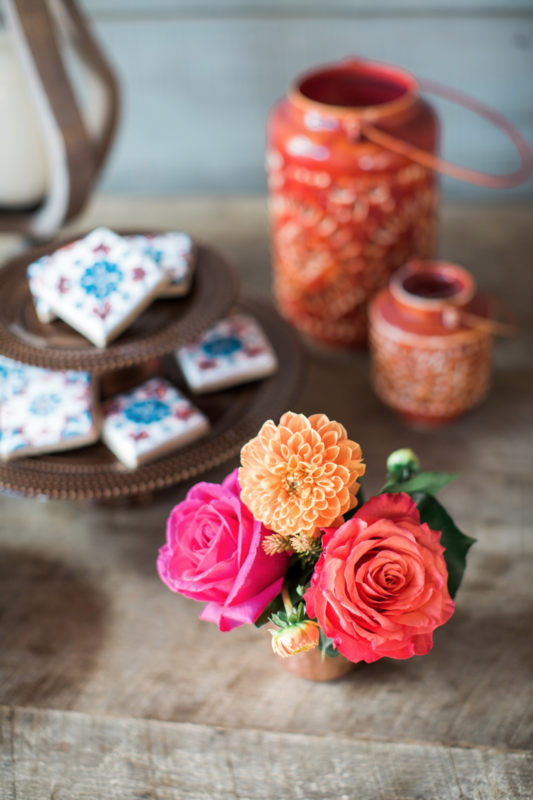 Each of the floral aspects of this design were created in house. From bouquets to the delicately draped floral rings. We achieved a vibrant blend of hues in pink, orange, blue, and green. Each vessel filled with garden roses, thistle, tulips, delphinium, and dahlias. 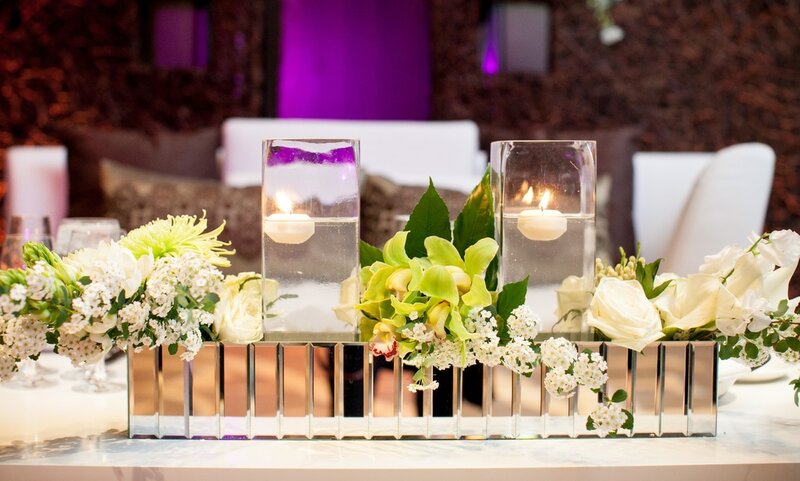 We wanted a structured, yet free-form feel, which was accomplished with the flower and greenery choices. 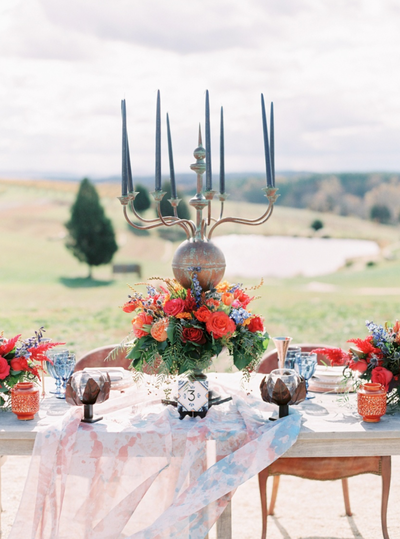 The vineyard backdrop provided beautiful hues of blue, green, and orange that we represented in our floral selections. 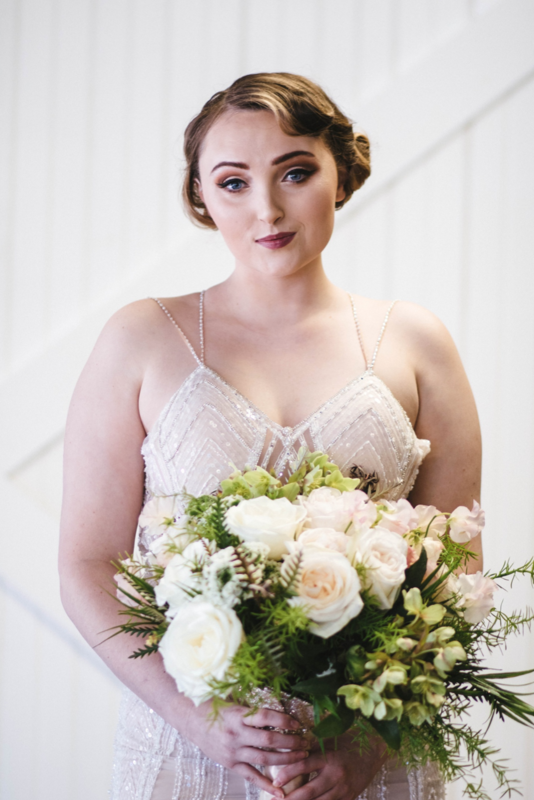 The hand tied bridal bouquet was an enormous array of loose tied blooms and brought movement to the brides mermaid gown. 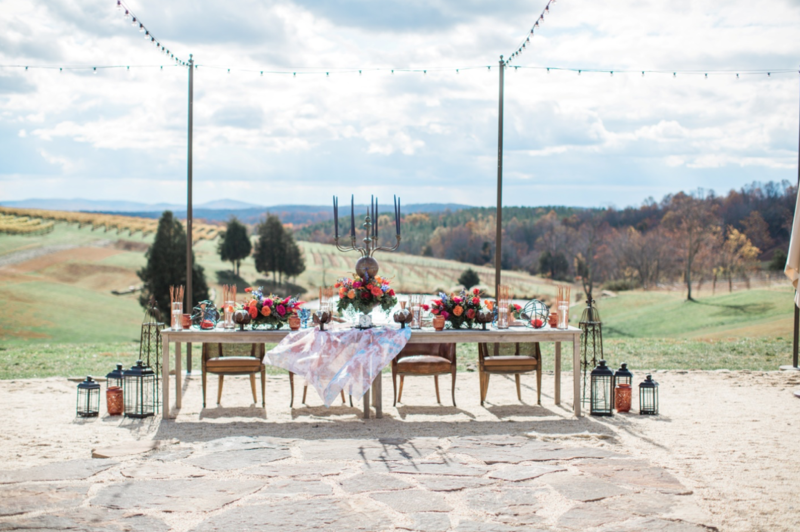 It was an incredible pleasure working with such talented and fabulous vendor partners on this vineyard stylized shoot. Head on over to our Facebook to see more images of our designs. You likely have more questions that you can think of right now. Your thoughts may feel a little foggy or you could feel like your swimming through a sea of too many decisions. So, to help you through this process, here is a short list of some of frequently asked questions (and our answers)! Have you worked at my venue before? We have worked in hundreds of venues across the DMV area. So the answer is likely yes! But we understand why you ask that question, but if our answer isn't yes, it shouldn't deter you! We are professionals- which means that we're sure to do our due diligence to research the venue requirements before we arrive. Do you have a minimum? We do! 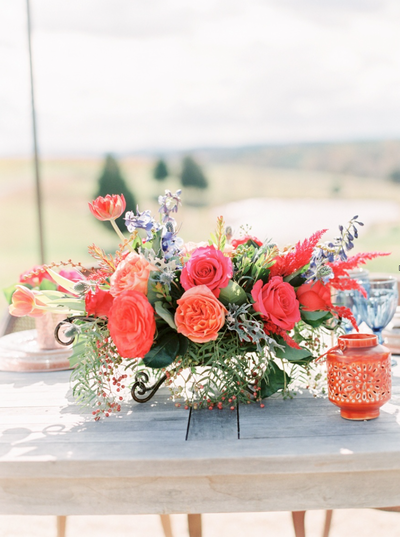 Our minimum order for wedding design is $6,000 for full-service floral design & installation. We do have budget friendly options for design and pick up. We handle personal (bouquets + boutonniere) flower orders and centerpieces that you or a designated person can pick-up! Custom proposals are sent for all weddings, social events, and corporate events. How far in advance should we book? About six to eight months before your wedding day is ideal. 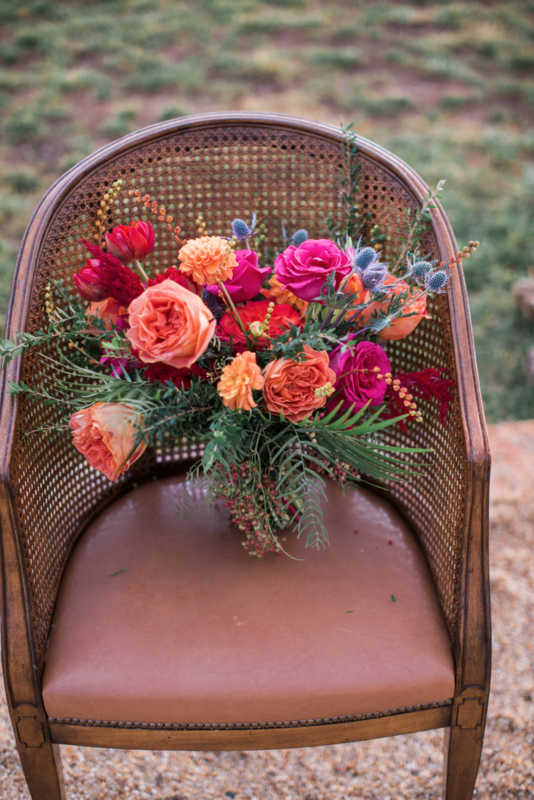 This helps us give you a more accurate estimate for both cost and floral availability. Social events and corporate events tend to have a much smaller ordering window. Do you have insurance? Absolutely! As a floral professional, this is of the upmost importance to us. We are licensed and insured. We also have plenty of references! Still have questions? We're happy to answer them! No question is silly, so don't worry about that! Send it to us here and we'll respond asap! 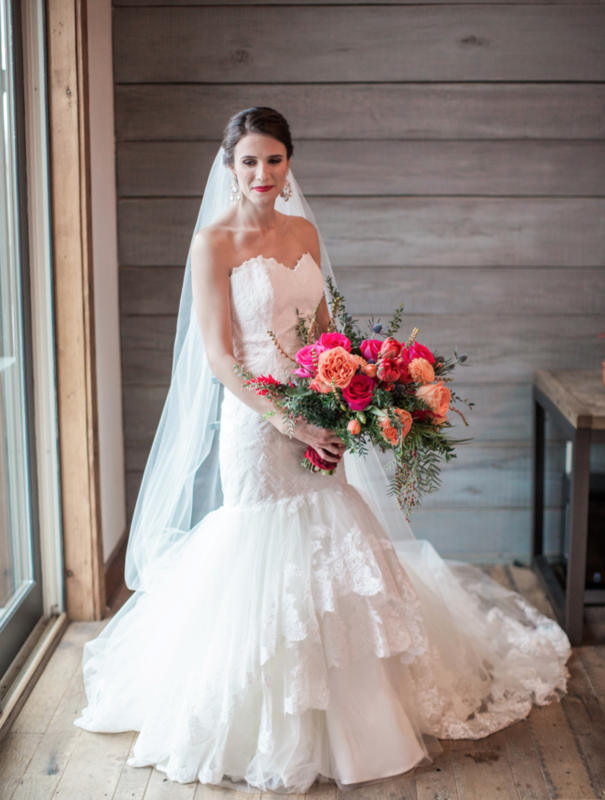 And be sure to check out this post with tips for selecting your wedding designer too! 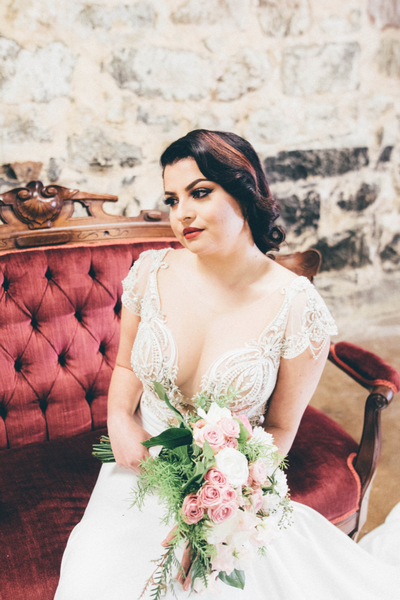 It's time for you to select the person who will make your wedding look and feel fabulous! It's a huge decision! We know that it seem overwhelming and exciting all at the same time. So here's 5 tips for selecting just the right person! ​Do your research! Okay, so this may seem like a no-brainer, but longevity & experience in the wedding industry matters. Florals are one of the most important design elements for many couples, and not selecting the right person for the job can be disastrous. So, do your research! Check reviews, look over the paperwork, ensure that your selection is licensed and insured. Set a realistic budget! Then be willing to adjust it. We may sound like a broken record here, but flexibility in your budget is necessary. If you have your heart set on a particular bouquet, centerpiece, aisle arrangement or other floral element, you may have to adjust your original budget. Flowers are usually more expensive that you anticipate- and if your design is complex or labor intensive, the budget has to reflect that. 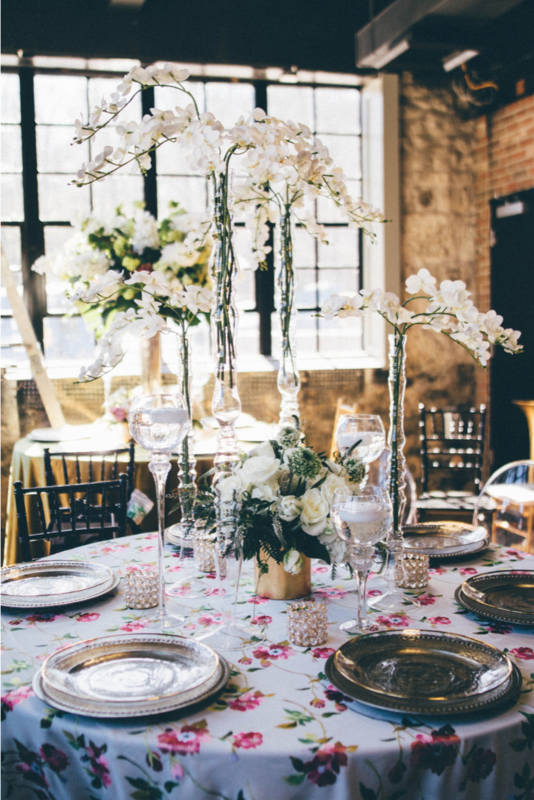 Hanging 3,000 florals from the ceiling above your head table? Yep, expensive (but you probably knew that). 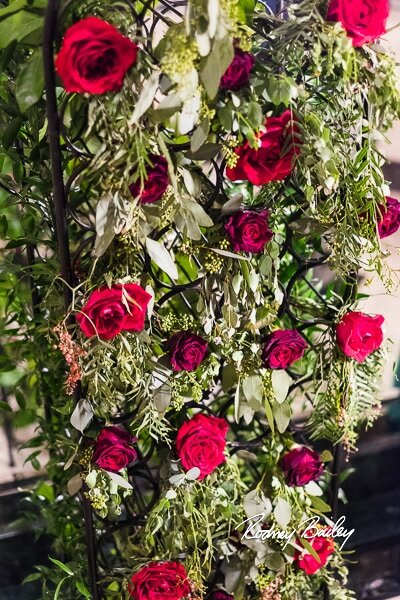 Having an extra large bouquet created with greenery and garden roses? Yep, that's expensive too. Which might be surprising. We don't mean to scare you. We just want you to be as prepared for your quote as possible! Consider your season! 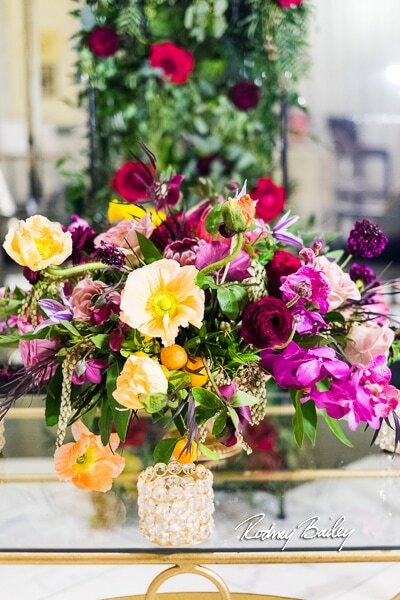 Flowers often cost more than you think, especially when you're requesting florals that aren't in the correct season. Think, peonies in July or Dahlias in February. However, there are "look-similar-enough" alternatives to almost every flower! Professional florists are part miracle workers, so if you selected someone who knows there stuff and that you trust, we're still able to create beautiful arrangements that work for the seasonality (and location) of your big day! On a related note, book your florists too soon could mean that your original quote changes due to market availability and conditions. The ideal timeframe is eight months out. Flexibility is key! As stated above, sometimes the Pinterest vision you have for the big day has to be modified a touch. And sometimes you think you want one thing, but realize that it won't fit with the venue. Think big picture and "feeling" - be flexible with the rest! Work with an event coordinator! They can help you prioritize your wishes for the wedding day and then allot your budget accordingly. 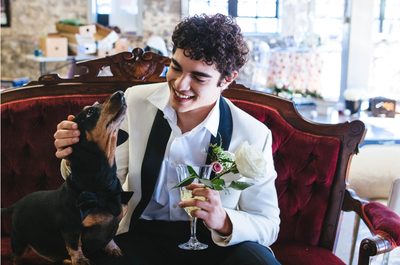 Also, they will alleviate SO much of the stress associated with the wedding. Working with a planner doesn't mean you have to "give up" the planning of your wedding day. It means you have a go-to person to help you with it all. As you get closer to the day, you'll need her (or him)! If you've selected someone with these 5 things in mind, you'll likely love every second of your design process! Want to schedule a time to chat? Why... we'd love to! We're so excited to announce our amazing new website and blog! galleries of designs we've created over the years! conceived over the years and continue to create today.